Regular readers of these pages will know that from time to time good surprises happen when someone I've not interacted with before gets in touch about catfish from their part of the world. Typically this is because they want to find something out, but in the case of this month's contributor, it was because he had something to share. Tom Giammarco got in touch several weeks back and has since added some great data and images to the site. For this I, and I know many other regular silurophiles, are very appreciative. However, Tom's really pulled the stops out with the following CotM on a hitherto nearly unknown aquarium catfish. I'll hand over to Tom now. As a child growing up in a New England suburb, I spent my summers outside by creeks and ponds or down in the salt flats, collecting small fish and invertebrates. Hour after hour, I would search through mud, submerged weeds and among stones and had developed quite a system for sorting through my catches with each swipe of the net or, more often than not, an old coffee can. I would decide what I wanted to keep based on compatibility with what I had and whether or not I had ever seen the aquatic creature I had caught before. Several decades later and I am still at it. Collecting and raising local fish has been a hobby wherever I have lived in the world and I have a particular soft spot for cold water aquaria. This followed me when I arrived in South Korea in 1995. Within a month after settling in, I had purchased a field guide to Korean fish to see what was here and which had the potential to be raised in a home aquarium. There were three fish I felt I absolutely must have. 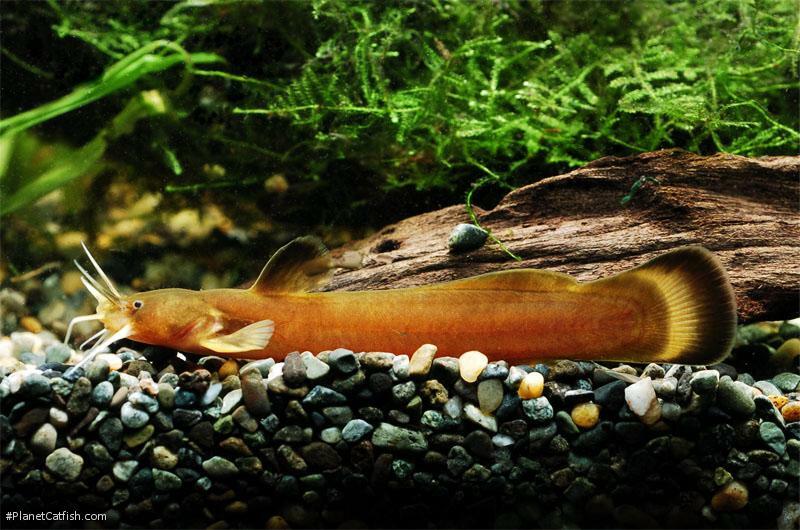 Among them was Liobagrus mediadiposalis, an attractive catfish that looked remarkably like the North American madtom cats. Unfortunately, while there were many interesting fish living in the rivers around me, the fishes I really wanted were further east in the region of the Nakdong River. Eventually, I was able to make the trip armed with some large dip nets, a minnow trap and a cooler with a battery-powered aerator that would keep the fish alive during the four-ride back home. Fishes living in shallows and weedy places are always easier to catch than fishes living in rapids and with the common name South Torrent Catfish (South referring to its range on the Korean peninsula although it is far from being the most southerly member of the genus), I knew that I would be fighting with some fast moving waters. Turning over rocks and trying to catch what was underneath proved to be very difficult, but fun. Soaked, bruised and bloodied, we decided to collect the minnow trap and call it a day. Lo and behold, among the fish in the trap were three beautiful specimens of the South Torrent Catfish. They were about 10cm long, yellowish brown in color with a dark dorsal fin and a dark band on the end of the caudal fin. One of them had an exceptionally beautiful tail that had a central band of yellow. I happily packed them up and took the trio home. A fish tank had been prepared for them about a week earlier. Knowing that they were nocturnal, there was no lighting on their first tank, and thus no plants. There was a powerhead filter to create current and an airstone for extra aeration. Over the standard aquarium gravel I had liberally scattered larger stones and several big rocks. There were also several artificial caves, submerged flower pots and ceramic cichlid breeding pipes. I had optimistically expected to catch about a half dozen of these fishes, so the tank was larger and had more hiding spots than was probably necessary, but the fish seemed to appreciate it. They were introduced to the aquarium and promptly hid. I would get a glimpse of them occasionally as they sought out ideal places to claim for their own. When first introduced, they huddled together, but were soon looking for their own homes. The artificial caves and pots were ignored and over the next few days I could see where the gravel had been pushed out from under the large stones. The fish rapidly adjusted their nocturnal habits to match feeding times. I fed them twice a day with frozen blood worms, brine shrimp and occasionally earthworms cut to appropriate, bit-sized pieces. Experimenting, I soon learned that they took prepared flakes with equal gusto. I also noticed when feeding that each of the caves they had excavated had at least two entrances. This had no doubt contributed to the difficulty in catching them in the wild. Later, I took to feeding them culls from my wild-caught Macropodus ocellatus which breed like rabbits. One day, while performing a partial water change and siphoning some water from the bottom, I accidently siphoned up some eggs. They were bright yellow from the yolk sac showing through and a pair of black eyes could be made out as well. I had siphoned up about a dozen and I assumed that there were more. However, I decided not to disturb the rock and the fish under it to see. If there were more eggs, I thought I would leave them with the parent to guard them. I decided to set up a fine mesh box for the eggs I had siphoned up. I was afraid of having them rest on the bottom as everything I have read indicated that they are attached to the top of the stone. On the bottom of a hatchery, they may have been subject to infection before and after hatching. I was worried about using anti-fungal medication because these fish are scaleless and I had no idea of the effect it would have on them. I suspended the mesh near the airstone so they were heavily aerated and in a constant current. Within two days, the eggs had hatched and the fry, still attached to the yolk sac, were bouncing around in the mesh. Once the yolk sac was absorbed, they proved to be active eaters taking even powder prepared food readily. I never saw any fry in the tank. I do not know if the eggs hatched or not. I lost two of the fry in the early days to unknown causes and gave some away when they were a little bigger. I added one to a cold water community tank I had with plants and a very gentle flow of water from an external box filter and discovered that the fish do not require the heavy current to be happy. The fish in the community tank also chose the largest stone and excavated a burrow for itself and comes out in daylight hours for a quick feeding when I feed the fish in the morning and evening. I am also sure to give it a special feeding right before I turn off the lights so it can feed more naturally at night. Liobagrus mediadiposalis has proven to be a fun addition to the community tank. In the species tank, set up as a natural habitat, they are rarely seen and a casual glance may have people thinking it is an empty tank. But in the community tank, it is a fish that I watch for when feeding as if it were a celebrity. However, I think successful breeding of the fish is going to be dependent on a good water flow as well as other conditions such as seasonal fluctuations of temperatures. The cold and temperate waters of the world harbor many fish that rival their tropical counterparts in beauty and interesting behavior. Unfortunately, most, like L. mediadiposalis are not currently available in the aquarium trade. Type Locality Rakuto R. at Bun-kei, Chosen, Korea. Etymology From the Greek, leios, meaning smooth, and bagrus, a name usually used for catfishes; in reference to the smooth head. Size 113mm or 4.4" SL. Find near, nearer or same sized spp. Identification Easily differentiated from the two other Korean Liobagrus species by having an upper jaw that is longer, thus slightly overhanging, the lower jaw. Both L. andersoni and L. obesus have jaws that are of equal length. Sexing Males have broader heads. Females noticeably plumper during the breeding season. Other Parameters These fish reside in the temperate zone and undergo a wide range of temperatures throughout the year. They may tolerate higher and lower temperatures for a short period of time. Torrent-like conditions are not necessary, though the water should have some flow. The filter outflow is generally adequate. Feeding Feeds on small invertebrates and fish in the wild. Adapts readily to prepared food. Furniture Provide plenty of large stones for hiding places and gravel. Make sure the stones are well set in the substrate as the fish will excavate caves beneath them. This fish has a preference for stones 30-40cm in diameter. Smaller stones will likely be ignored as will artificial caves. Plants are not necessary but floating plants are useful as they dim the lighting. Compatibility Non-aggressive, but it should not be trusted with small fish and its nocturnal feeding may unintentionally harass other bottom-dwelling species. Breeding While Uchida reported in 1934 that the females guards the eggs, and much available literature still follows his assessment, recent researchers and aquarists suggest that it is the male who guards the eggs. References Dobutsugaku Zasshi [Zool. Mag. Tokyo]v. 48 (nos. 8-10) - pp673 - Pl. 24 (fig. 3). There are 2 registered keepers, view all "my cats" data.